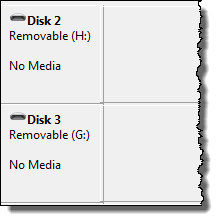 What are these "no media", "removable" drives on my system? Flash memory card readers connected to your computer often appear in disk management, taking up drive letters even though they're not currently in use. I purchased your ebook Maintaining Windows XP. I was working in the The Opportunities section on page 82. When I opened up my Disk Management, I found that I have several disks two through six, also labeled Removable E through G, with no media associated with them. I'm wondering what to do with them. I have my main disk C as well as one disk associated with my external hard drive labeled "My Book (M:)" and another disk associated with the program WD SmartWare (L:). The layout on all of three is Partition and the Type is Basic. The SmartWare is a program that came with my external drive. I have drives like those on my machine: drive letters set aside and listed as "no media". "Removable" refers to "removable media." Basically, any kind of disk or disk-like thing that you can insert and remove from your computer. Floppy disks, once upon a time, were "removable media" because you could pop them out at any time. "... in general the best thing to do with these unused devices is nothing at all." CD and DVD drives are similarly removable media devices. USB drives are technically also removable media, but of course, they're not listed until they're attached. Once a USB drive is attached, its driver is loaded and the drive appears in the appropriate lists. "No media" is the other clue. Device drivers are installed when the device or drive is present and attached. So floppy disk drives or CD/DVD drives without media inserted are displayed and take up a drive letter, even if there's no disk inserted. Somewhere on your machine, you have a device attached that could contain media, but does not. Take up a drive letter. Show up in disk management. Are listed as having "no media" - because they don't; nothing has been inserted. I'm guessing that you have something similar. With the proliferation of CF, SD, micro-SD, Sony's old memory sticks, and a bunch of other flash memory card types, media slots that you would use to actually read them on your computer are proliferating as well. "N-in-one" card readers - These are typically USB devices that you connect to your computer which provide anywhere from one to four or more slots into which you can insert just about any conceivable type of flash memory card. When the device is connected, it appears as some number of separate drives. Convenience devices - I bundle my monitor into this category. Any device that you happen to have for some other purpose that also includes one or more flash memory card slots as a convenience. Monitors might be one common example, but I've seen it on keyboards and other accessories as well. Your computer - Particularly with many newer laptops, you might find that you have one or more memory card slots that you might not even know about. These most commonly appear to be for the SD card, presumably to make transferring photos from digital cameras faster and easier. While it is possible to remove them from the drive letter allocation pool (just right-click in device manager and change the drive letter), the best thing in general to do with these unused devices is nothing at all. Some you might actually use, now that you know you have them. The rest, other than eating up a drive letter and a minuscule amount of memory, are completely benign and don't impact your system in any way. Safely Remove Hardware: where did the icon go? How do I safely remove hardware without it? The "Safely Remove Hardware" icon can occasionally disappear. It turns out there's a simple workaround to safely remove hardware anyway. I noticed that also. I suspected that was the case but now I know. I found several of these and I went into Device Manager and changed the drive letters into U:, V:, W:, X:, Y: and Z: to keep them out of the way in case I wanted to install another HD which would be G:. I happen to have an HP printer with a card reader slot - it shows up as a drive also. how can i solve this no media in disk error?My card reader is having this problem.When it is plugged its shown as 'please insert a disk'.I tried to change the drive letter.But it doesn't work as there is no media. hi , I have observed a problem with my windows system. 1.I tried attaching a device , it appears in disklist but not in volume list. 2.If i change the label name , it works fine and gets attached.But the label was working fine for some time and suddenly it stopped. 3. It works fine on linux(on the same system->dual boot). 4.One more interesting thing is no drive letter is assigned by windows(as seen in storage disk management) , and it's contents cannot be accessed. It appears as a removeable disk.